I am happy to share slides from any presentation I give. I generally try to post slides from major talks here, but if something is missing that you are interested in, please reach out and I will add it. 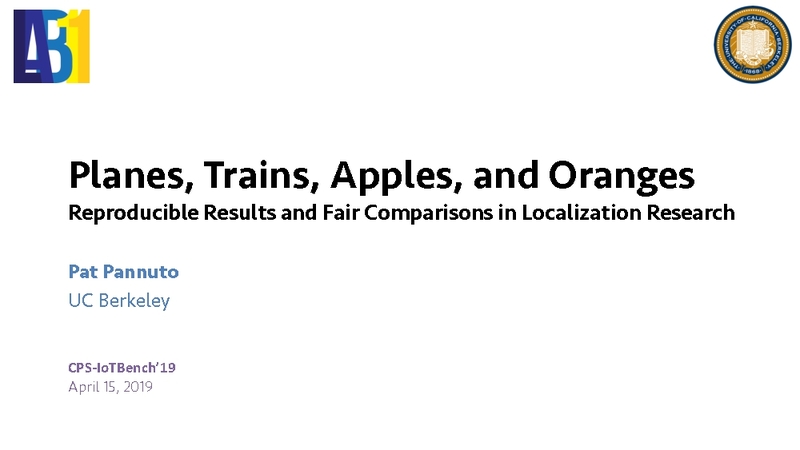 Localization remains a continually captivating research problem as so much of human interaction and reasoning relies on location-based contexts. However, decades of work have revealed that there is no one-size-fits-all solution to the bevy of applications that require location information. If every application sets its own requirements, how then do we measure progress in localization technology when each technology sets its own benchmarks? How can we tease apart improvements to underlying physical layer estimates from enhancements to algorithms that process these data points and measure these contributions against the development of systems that exploit fusion to realize better gains than either physical or algorithmic advancements alone? More questions than answers, this talk aims to lay out the state of the field as it is today and to invite discussion on what defines fair comparisons and how to enhance the creation of reproducible artifacts, experimental configurations, and location traces and datasets. After a lot of work in localization and tracking of motes, drones, and people, this presentation aims to ask a bigger question: Is it possible to localize every physical thing in the world? If we do so, how might the way that humans and computers interact with the world change? 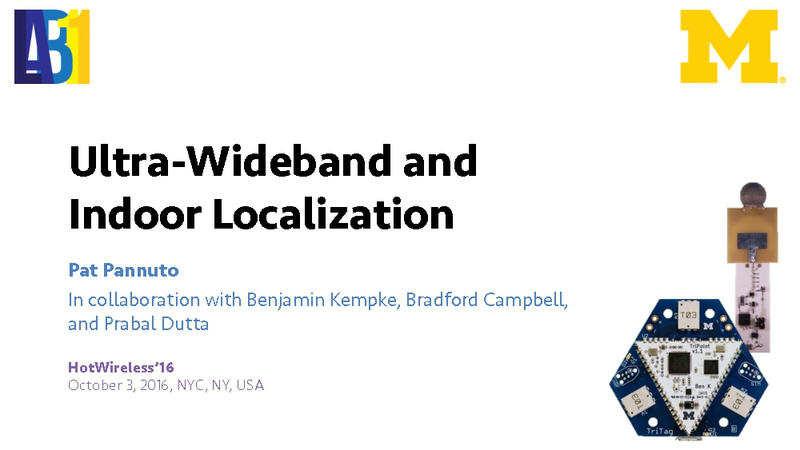 We then introduce Slocalization, a new ultra wideband backscatter localization system that takes a step towards truly ubiquitous localization. With Slocalization, we introduce the latency/energy tradeoff to localization research, demonstrating that we can achieve decimeter-accurate localization of sub microwatt tags – at a millihertz update rate. The primary challenge is recovery of the very low amount of reflected energy afforded by ultra wideband backscatter. The key idea is to leverage the stationarity and stable periodicity of the tag to enable repeated integration of estimates of the channel to slowly lift the tag signal out of the noise. We empirically validate Slocalization up to 30 meters in a bi-static configuration (anchor→15m→tag→15m→anchor), requiring about fifteen minutes to realize sub-decimeter accuracy. The Near Zero Power RF and Sensor Operations (N-ZERO) program has the goal of developing the technological foundation for persistent, event-driven sensing capabilities in which the sensor can remain dormant, with near-zero power consumption, until awakened by an external trigger or stimulus. If successful, the program could extend the lifetime of remotely deployed communications and environmental sensors—also known as unattended ground sensors (UGS)—from weeks or months to years. The N-ZERO program emphasizes the development of novel low-power sensors and wakeup frontends, initially with the intent of using the frontends to opportunistically wake traditional sensing and communication systems. I was invited to the program review to discuss the viability and technical challenges of integrating MBus frontends with N-ZERO chips, towards the long-term vision of replacing the high-energy traditional sensing and compute frontends with ultra-low power systems, such as the Michigan Micro Mote. HotWireless is one of my favorite workshops, I feel like I always come away with a few things that I find really interesting coming down the pipe. 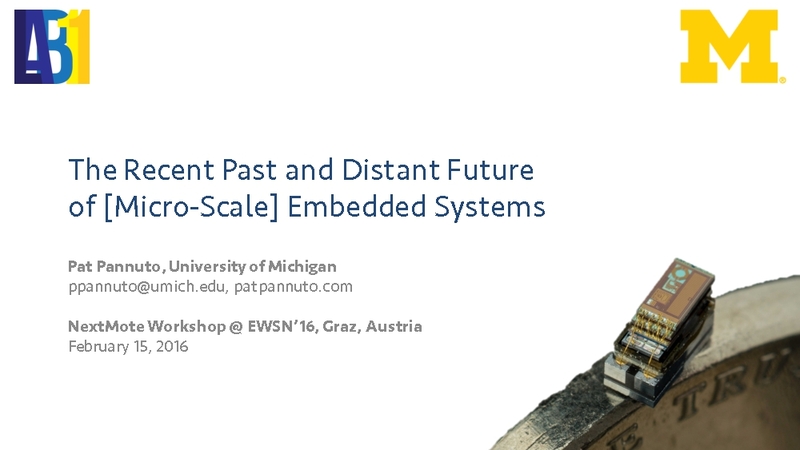 This year I was invited to come give a talk on our recent work in ultra-wideband localization technologies. 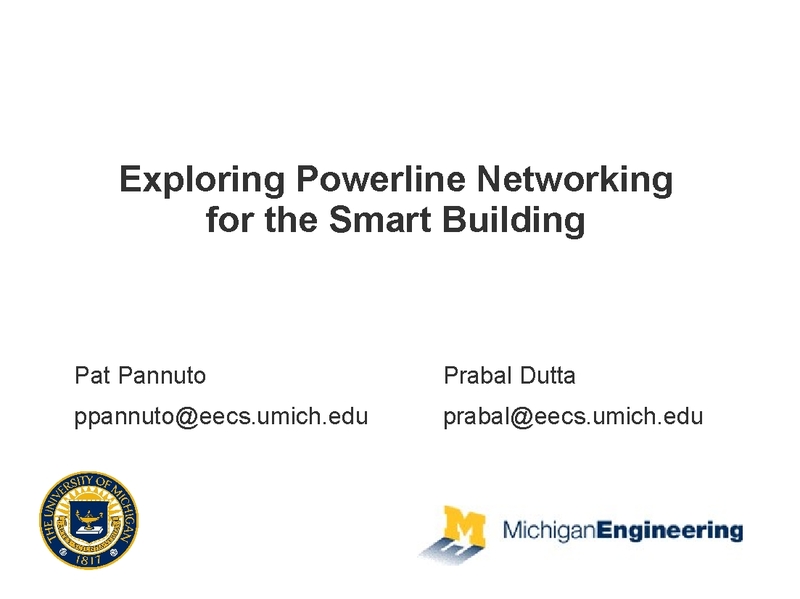 This is a particularly fun talk for me as it centers around two systems that were originally proposed at previous HotWireless workshops. 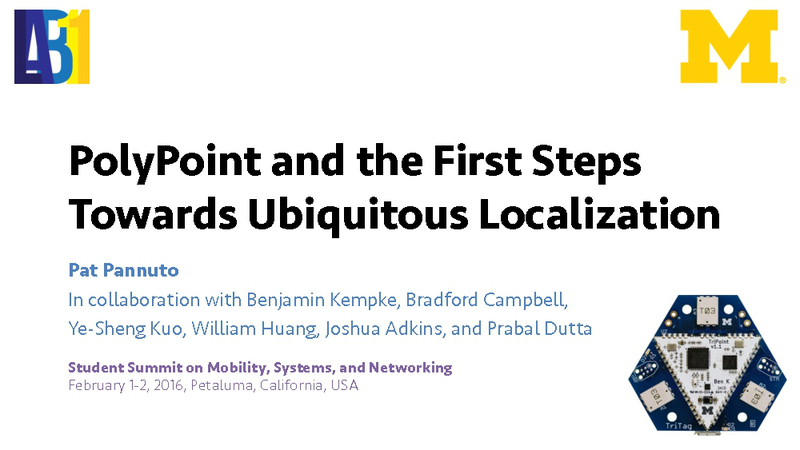 First we discuss SurePoint, a refinement of the PolyPoint system presented at HotWireless'15, that realizes a robust, reliable, and scalable indoor localization system. Then we look at what we can achieve with a non-COTS UWB system with Harmonium a descendent of Harmonia from HotWireless'14, that exploits asymmetry between the tag and anchor to realize an inexpensive (<$5), lightweight (3g), and low-power tag (75mW). Finally, we close with some thoughts on open ideas for UWB research, including backscatter, protocol refinements, and better utilization of the channel impulse response. NextMote was a new workshop at EWSN'16. Inspired by the work we have been doing in millimeter-scale system design, I was invited to come I was invited to come give the keynote presentation to open the new workshop. The talk traverses the evolution from yesterday's motes to "next" and "next-next" generation motes. Along the way we'll face a few harsh realities that will limit and shape future evolution (a trillion devices cannot demand replacing a trillion batteries), uncover recent results already pushing boundaries (including highlights from the design and implementation of the world's smallest computer), and explore some of the possibilities that emerge when we rethink designs from the ground up (can we build useful motes that don't include CPUs?). This event mirrored MSR’s traditional faculty retreats, only targeted at senior-level graduate students. This was one of the most enjoyable events I have had the pleasure of attending. Lots of really bright people working on really interesting things with great opportunities to converse with peers and senior members in the field equally. I would highly recommend that anyone given the opportunity attend (and that faculty actually nominate your students when asked!). 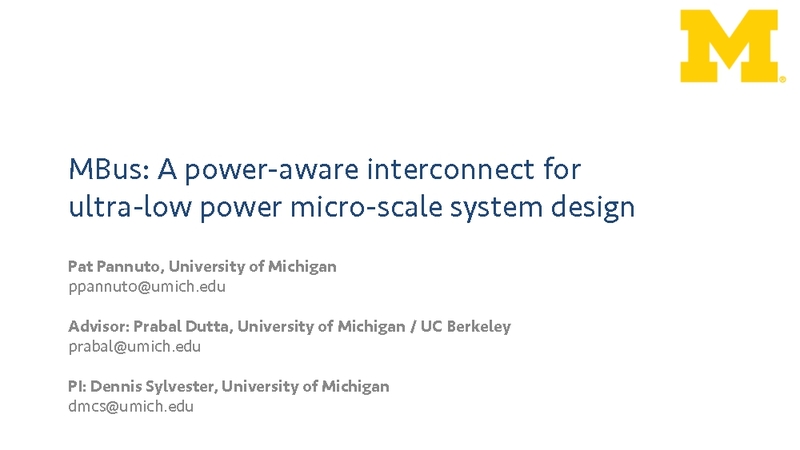 This presentation introduces MBus, the missing interconnect technology that enables the millimeter-scale computing class. 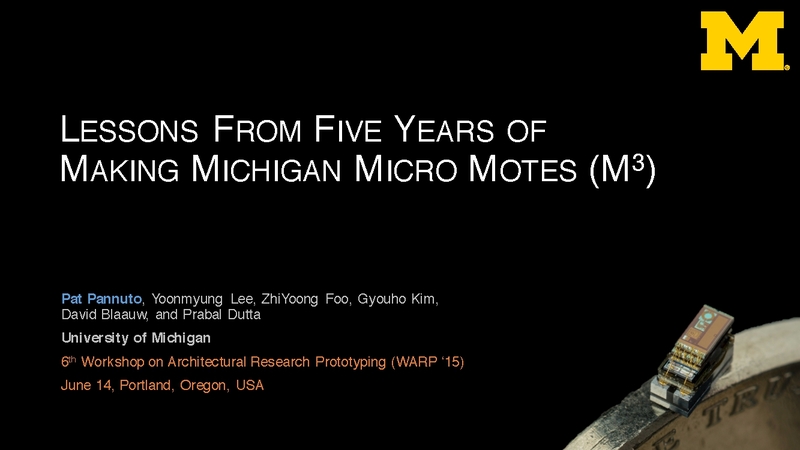 From the Michigan Micro Mote (M3) project, an effort develop next-next generation millimeter-scale computers today, we discovered that the traditional technologies for composing embedded systems, I2C and SPI, cannot scale to millimeter-scale designs. We drafted a set of fundamental requirements for a millimeter-scale interconnect, and show that no existing interconnect satisfies these requirements. We then take these requirements and design a new interconnect, MBus, optimizing for millimeter-scale systems while providing a superset of features from existing interconnect technologies. For more information on MBus and the M3 project, visit mbus.io. WARP'15 hearkened the return of a workshop that had been on a five-year hiatus. The workshop seeks to both motivate the importance and value of actually building systems in the architecture community as well as to share lessons and experiences from fabrication. This talk begins by highlighting an architectural problem, the absence of an interconnect technology that is appropriate for mm-scale modules, and our solution to that issue: MBus. The talk then covers a breadth of the system, manufacturing, and design issues that we have solved and are struggling with for the Michigan Micro Mote project. Finally, the talk closes with an introduction of an emerging issue in low-power system design, the need for an indirection layer for peripheral control and semi-automated operations, and our solution to that issue, the MPQ protocol for MBus. TC111 was a online course focusing on skills and strategies for collecting, managing, analyzing, and visualizing Information Communication Technologies put on by TechChange. I was asked to give a guest lecture on the capabilities and added value of sensor deployments as well as the challenges in recovering data from deployments, with a focus on how non-technical organizations can realize and utilize sensing. This presentation was in collaboration with Guillaume Kroll at the Center for Effective Global Action (CEGA). VLCS'14 was a new workshop attached to MobiCom'14. 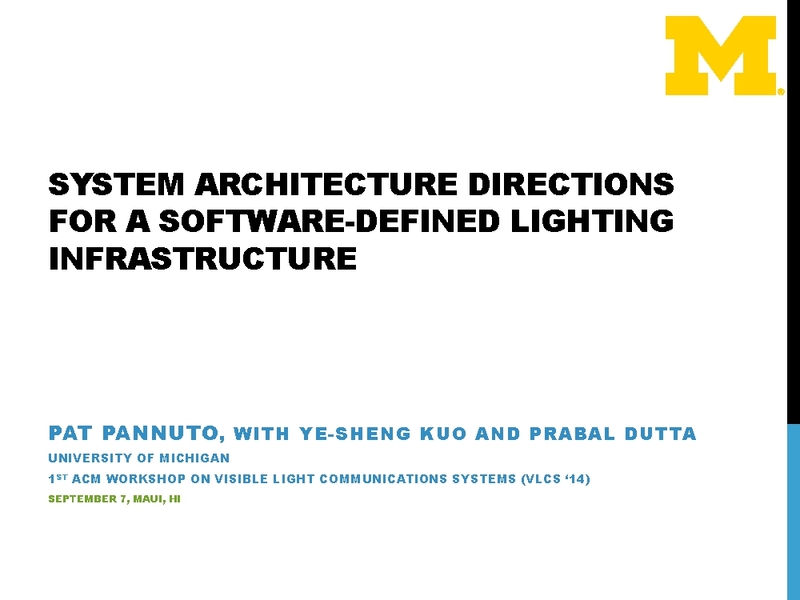 This talk presented our initial research into the design of Software-Defined Lighting (SDL), in particular looking at the diversity of applications already created and coming down the pipe and looking at ways of mapping all of these applications to a single, unified lighting network. A copy of the workshop paper is also available. The workshop was a kickoff for the Stanford Internet of Things Industrial Research Program. I was asked to describe the state of security for the Internet of Things, in particular looking from the perspective of an embedded systems hardware and network developer. 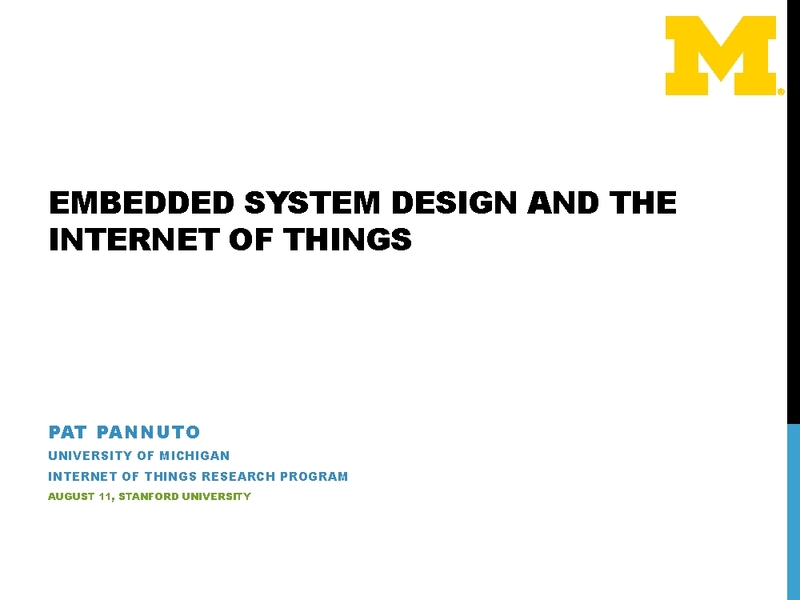 The talk gives an overview of some recent research, some challenges and directions in networking, and a discussion of the hardware trends, expectations, and requirements for embedded systems, all with an eye towards security. The State of the Science conference put on by DIL, gui2de, CEGA, and the USAID Higher Education Solutions Network. 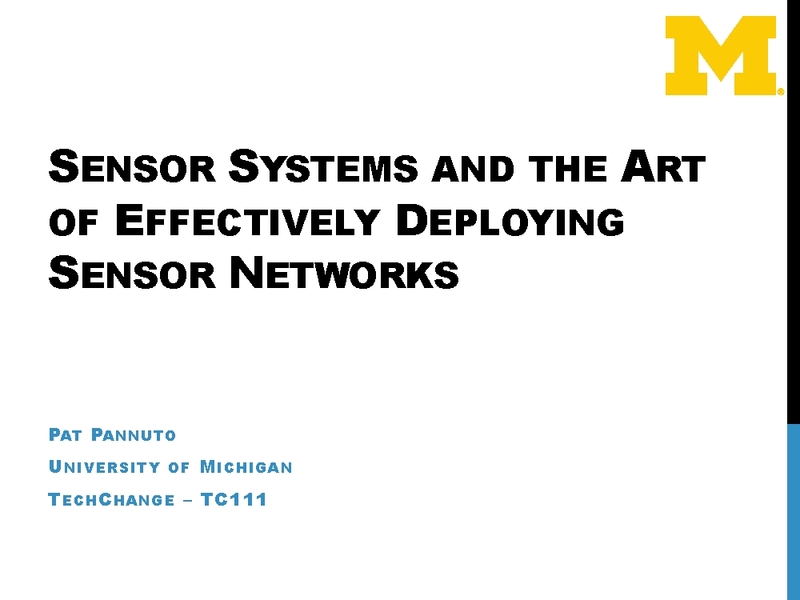 I was asked to give a presentation on the state of sensors and sensor networks as they are available today with an emphasis on the challenges of actually deploying systems. I was also asked to touch on the current state of research in the area and what kinds of interesting systems are coming down the pipe. The TerraSwarm Research Center holds an annual meeting for all participating members. During the meeting, I was asked to give a "from the trenches" talk, describing my current research, which at the time was focused heavily on MBus. The Michigan Hackers are a student group at the University of Michigan who attempt to bring together people interested in building system. For the last few years, they've thrown the largest hackathon in the world. In their nascency, I was invited to give one of the first tech talks. 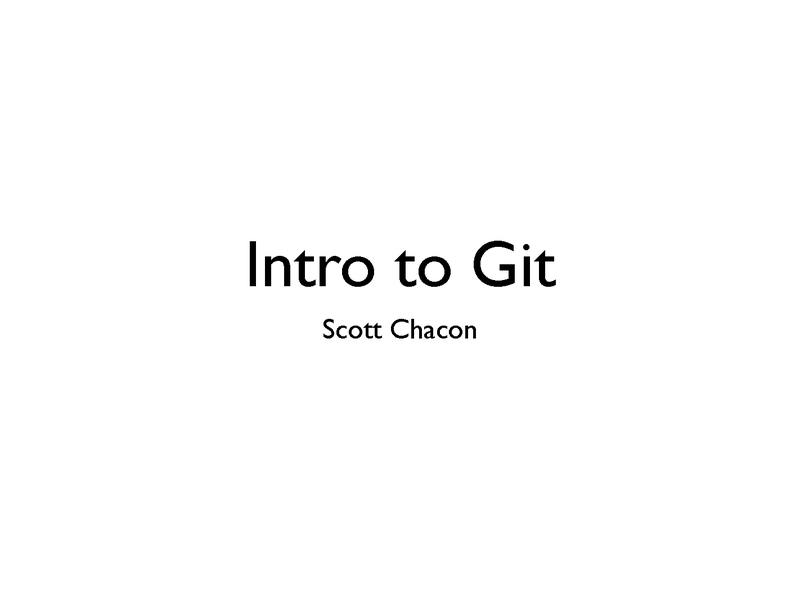 The audience was primarily experienced hackers, so the goal of the talk was to dive into the internals of git. I presented a slide deck put together by Scott Chacon, available here. IP+SN 2011 was a workshop attached to the IPSN 2011 conference in downtown Chicago. 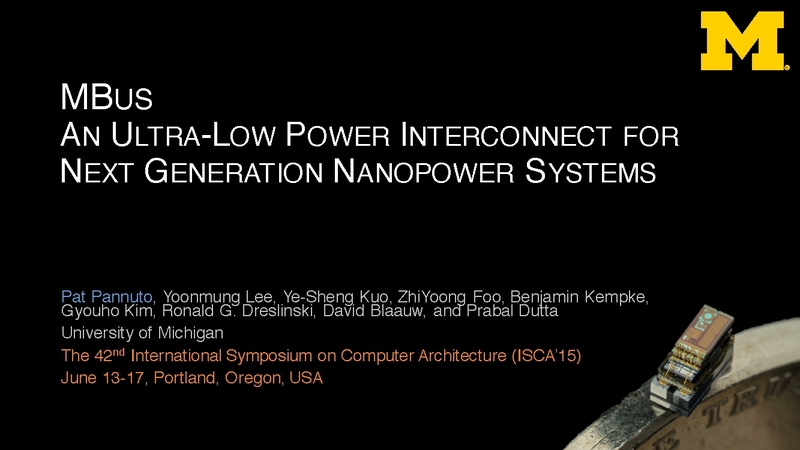 I attended this workshop as an undergraduate, presenting some of the first research I ever worked on. The impetus for the work was trying to reconcile the cognitive dissonance of using wireless as the medium to connect AC power meters, devices that are literally wired together already. The result was that powerline networking is not as trivial as I'd hoped, with a fairly non-intuitive connectivity graph. The takeaway was that hybrid routing, leveraging the physically long hops provided by powerline communication and using wireless to bridge disjoint powerline networks, would likely provide the most efficient building-wide network.